Identity is an important building block to any app. Even if it’s not top of mind when you’re building out new features, authentication is critical to get right. We realize developers want their users to have an efficient and secure experience with their products rather than dealing with forgotten passwords that prevent app usage. The Google Identity Platform is a suite of developer tools that cuts friction out of every step of getting people signed in: Smart Lock for Passwords, Google Sign-in, and Identity Toolkit. Smart Lock is a password manager built into your Google account. It can automatically sign you into an Android app, and autofills credentials on websites viewed with Chrome. It removes the need to remember and type in password credentials. We're now extending Smart Lock as an API to app developers and publishers, starting with Android. Android developers can programmatically save and retrieve credentials, and automatically sign their users in across devices and websites in Chrome. Companies like Eventbrite, Orbitz, Netflix, Instacart, the New York Times, and soon — LinkedIn, are using Smart Lock for Passwords to get people automatically signed-in across their properties. For new account sign-ups, or first-time sign ins, your users now have the option to save their passwords to Smart Lock, and be automatically signed-in subsequently. How does Smart Lock for Passwords work for your app or site? It recognizes and pre-fills login credentials across devices. When a user signs into or signs-up on your property, they’ll see a Smart Lock prompt to save their password for future use. If they accept, they’ll never have to enter a password again on your Android app or website on Chrome. 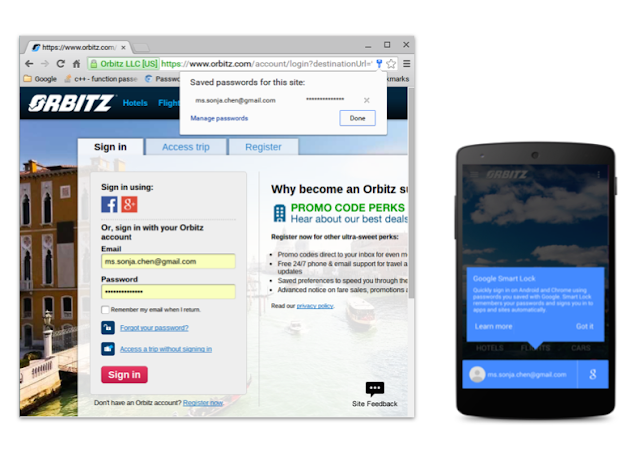 In turn, this helps your app or site boost sign-up and sign-in rates for new and existing users. This also means when your users buy and activate new devices, they can easily download and get logged right back into your app using the proper account. You don’t have to spend resources in re-acquiring them again, or encounter forgotten passwords along the way. Integrating with Smart Lock for Passwords lets your users save their password on one device, and be automatically be signed-in on other devices. Here’s how early partners are using Smart Lock for Passwords, which you can see rolling out in their Android apps and websites on Chrome. Eventbrite easily integrated and tested SmartLock in their app to increase the number of signed in users, because signing in "gives users a more personalized event discovery experience and a more seamless ticket purchase experience", says Atul Kakkar, Senior Product Manager at Eventbrite. Later on this year, we’re planning to offer new features including support for sync passphrases and Smart Lock for Passwords API support on other platforms. Stay tuned! Google Sign-in is the gateway to securely connecting Google’s users and services to your app or site. It reduces the burden of login for your users, by enabling them to sign in with their Google account—the same account they already use with Gmail, Play, Google+, and other Google services. 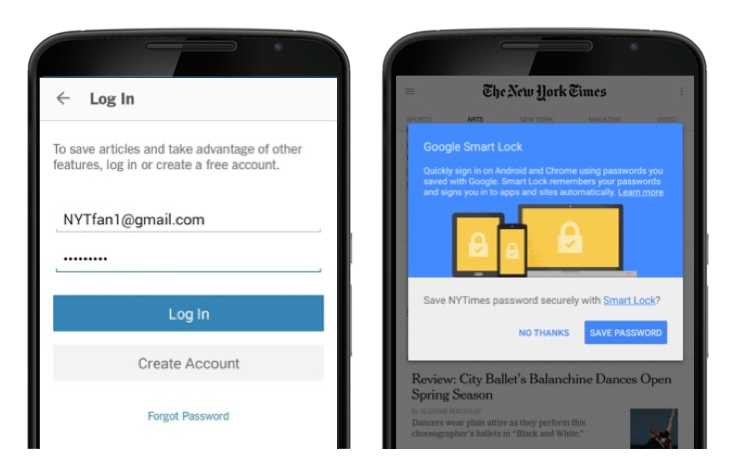 The New York Times was able attribute a 20% lift in new registered user signups to the implementation of Google Sign-In, in the months immediately following launch. Identity Toolkit gives you a robust, more secure authentication system that helps you do sign-in the right way, and can grow with your app. The toolkit supports email and password authentication as well as major identity providers including Google and Facebook. Even non-technical developers can add future sign-in options and migrate existing users with simple configuration changes. Getting started with Identity Toolkit lets you easily scale your auth system as you grow across platforms.